The Independent Review of Football Policing in Scotland found that the force is missing an opportunity to tackle crime. It suggests that officers don’t apply for civil football banning orders for known troublemakers as they are seen as being too costly. It comes after a series of incidents at matches in recent months – including sectarian abuse and missiles being thrown on to pitches – and also claims that organised groups of thugs are arranging clashes with rival supporters in advance of matches. In Scotland, a football banning order can be handed out by the courts when someone is convicted of a football-related offence. Alternatively, they can be dished out via the civil route through summary application. This might be when police have reason to believe someone is involved in football-related offences, but they are not facing any criminal charges. In the latter case, the summary application is lodged at a sheriff court on behalf of the chief constable. The order prevents a person from attending any regulated football matches. They also have to report to a police station and could be asked to surrender their passport to prevent them from attending matches outside the UK. Each order can be tailored by a sheriff. South Yorkshire Deputy Chief Constable Mark Roberts led the review which was commissioned by Police Scotland chief constable Iain Livingstone. The report said: “Current Police Scotland policy requires the chief constable to approve any summary banning order applications and there is a perception (not shared or endorsed by chief officers) the force is reluctant to make the financial investment to pursue them and very few are progressed. David Hamilton, vice-chair of the Scottish Police Federation, believes the football clubs themselves have a role in enforcing this. He said: “Our experience of speaking to officers is that to get a football banning order on the civil route requires a considerable amount of circumstantial bits of information, bits of intelligence and the barrier is actually building that picture. 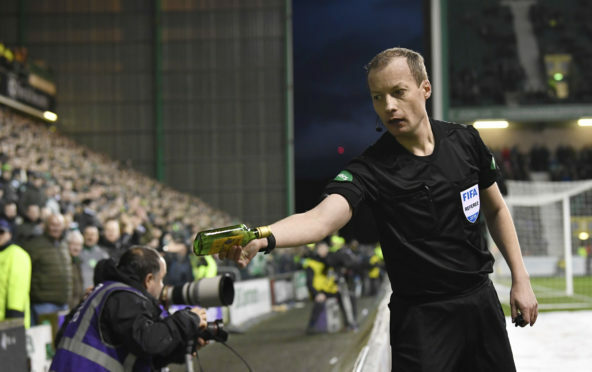 The report said: “The current number of banning orders in Scotland appears low, which raises questions as to the effectiveness of the evidence-gather activities of (FoCUS), and others, in filming fans. Hibs fan arrested after pitchside tussle with Gers captain James Tavernier. Assistant referee suffered a minor injury when he was hit by an object thrown from the crowd. Former Hibs boss Neil Lennon was grounded after being hit with a coin at Tynecastle. A bottle of Buckfast was thrown at Scott Sinclair during a Scottish Cup game. He was later hit with a coin. Kris Boyd was struck with a coin as he warmed up before coming on as a substitute. Fans allegedly spat and threw coins at a United supporter who had been knocked unconscious. Rangers star Alfredo Morelos was struck with a coin thrown from the stands as he celebrated a goal in a 2-0 win.